NO BREAKAGE, NO SPILL, NO WORRY WITH MONTIEN BOTTLE PROTECTOR! This resuable set of bottle protectors is ideal for protecting your fragile bottle so that you can always feel confident in bringing some of that delighful experience back with you and enjoy it. You can use the reusable bottle protectors for flights, cruises, shipping and more. That is also a ideal gift for wine lovers! With double ziplook and velcro combo, the content will be sealed inside. Designed to be a travel friendly companion, the bottle protector sleeves are lightweight and collapsable that can be used over and over again! Being A Part Of Our Family By Clicking The ADD TO CARD Button Right Now And Get Your MonTien Wine Bottle Protector! MULTIPLE LAYERS -- Bottle protector sleeves are designed with two layers. The outer is transparent and the inner is bubble. These layers are made from PVC plastic which itself offer a form of protection for wine bottle. Travel with your tasty wine without worry with MonTien Wine Bottle Protector now! DOUBLE ZIP LOCK & LEAF PROOF -- Inner bag and outer skin attached is to prevent scrunching. The triple seal protection including a dual zip lock feature and Velcro seal, keeps the bag air tight and your luggage safe from leaks. If a bottle happens to break inside of it, it is leak proof so you don't have to worry about it making a mess all over. REUSABLE VALUE -- Designed for traveller who use the protectors again and again. These wine bags pack flat in a suitcase making it easy to take in cars, on planes and cruises. The bag is especial for airline with wine, champagne, liquor, olive oil, perfumes and other fragile glass bottles up to one liter. 100% SATISFACTION GUARANTEED. 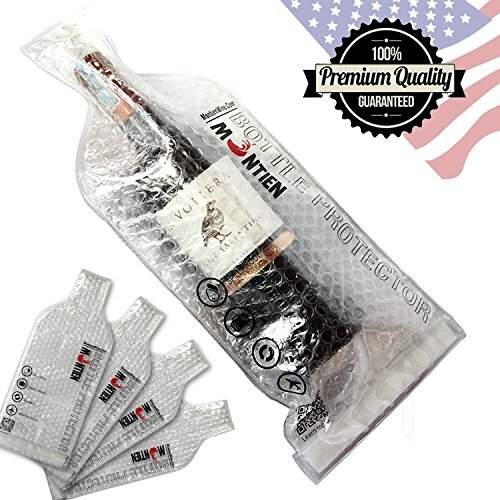 HOW DOES MONTIEN BOTTLE SLEEVES WORK -- Insert the wine bottle into the open end of bottle transport bag. Push the wine bottle all the way into bag until it fits snugly. Allow excess air to escape then close the zipper-style locking seal. Roll over the end and Velcro seal. If you have any questions about this product by MONTIEN, contact us by completing and submitting the form below. If you are looking for a specif part number, please include it with your message.